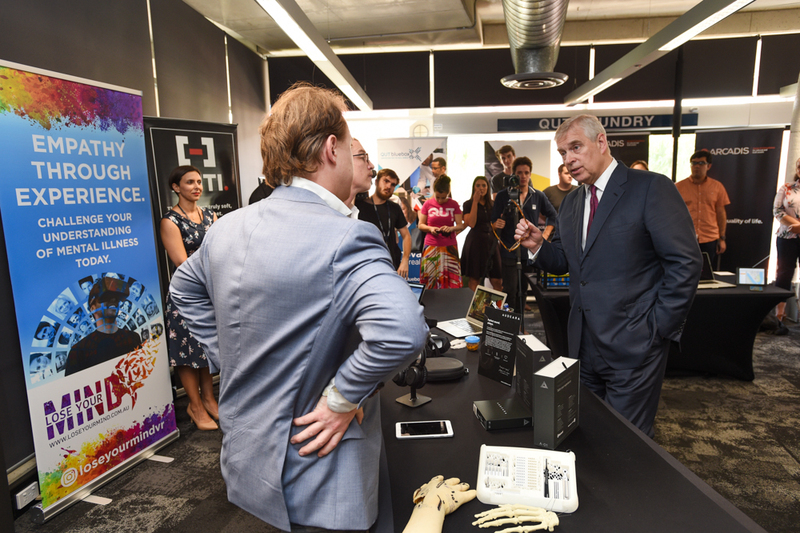 His Royal Highness The Duke of York explored QUT’s latest developments in robotics and entrepreneurship in a private visit to the university today. Upon arrival at Old Government House at QUT Prince Andrew was greeted by Minister for Local Government Stirling Hinchliffe and QUT’s Vice-Chancellor and President Professor Margaret Sheil. At the Science and Engineering precinct, he viewed The Cube, one of the world’s biggest interactive display screens, along with high-school students who were attending a science, technology, engineering, arts and math (STEAM) Experience Day program. 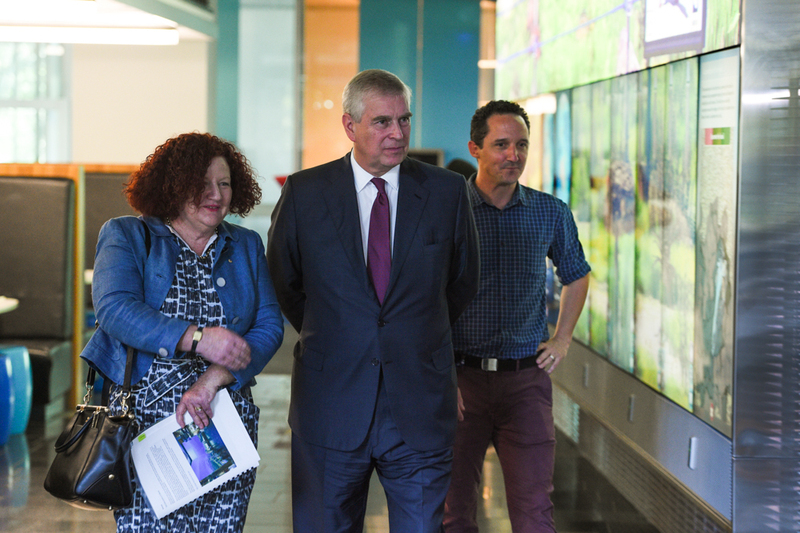 QUT Vice-Chancellor Margaret Sheil, The Duke of York and Simon Harrison at The Cube. 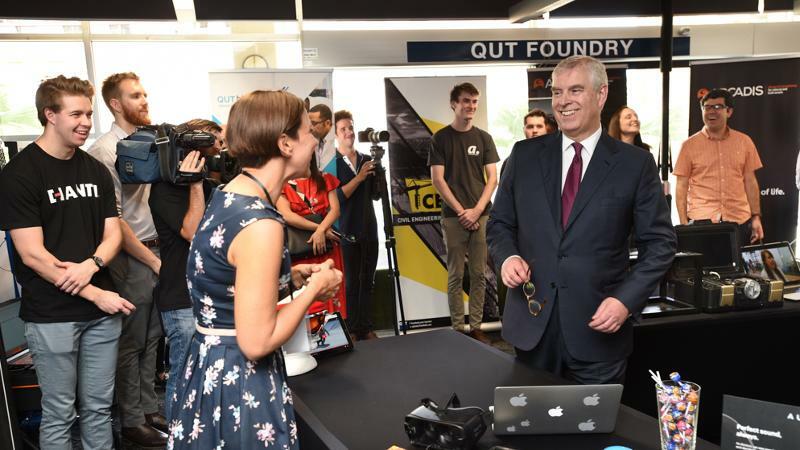 Distinguished Professor Peter Corke and Dr Sue Keay briefed Prince Andrew on the latest robotics projects underway at the Australian Centre for Robotic Vision headquartered at QUT while PhD researcher Andrew Razjigaev demonstrated the medical robot, ‘Snakebot’. Snakebot demonstration with Professor Peter Corke and Andrew Razjigaev. The Snakebot robotics project has seen surgeons and roboticists join forces to explore how autonomous and semi-autonomous robots could be used in surgery, using keyhole surgery in the knee as a way to explore the technology. Such robots, have the potential to revolutionise surgery and promise enormous benefit to the developing world where there is a shortage of surgeons trained in specialised procedures. Prince Andrew was also informed on the Centre’s research surrounding Softbank’s social robot Pepper which is being trialled in Townsville Hospital as part of a five-month research project, spending time as a concierge in the hospital and also providing information to patients and visitors on influenza vaccination. Researchers, including Dr Gavin Suddrey, design and develop various applications to assess the impact of social robotics, research that complements a State Government strategy to explore the potential for humanoid robots. 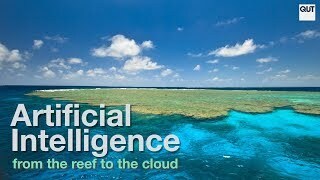 RangerBot is a multi-purpose marine reef monitoring and management tool. 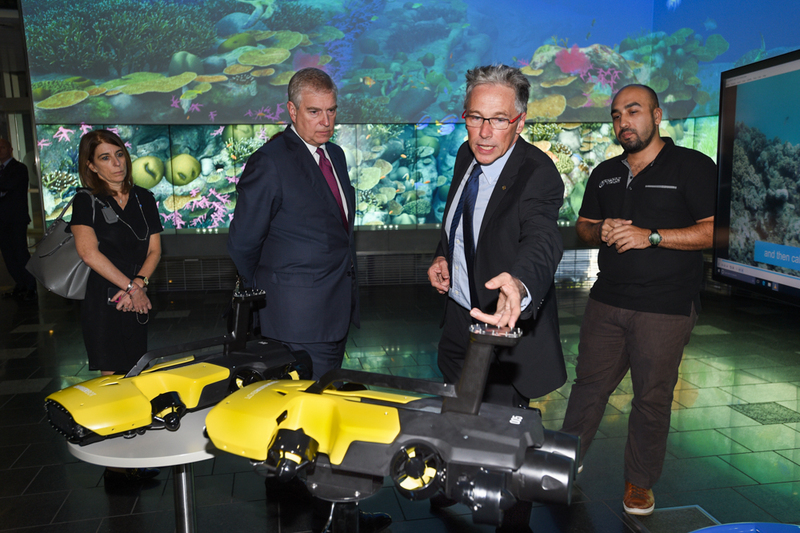 While QUT’s LarvalBots are currently on The Great Barrier Reef preparing to disperse coral larvae over reefs in need of restoration, Prince Andrew inspected RangerBot, the multi-purpose marine monitoring and reef management robot from which Larvalbot was adapted. 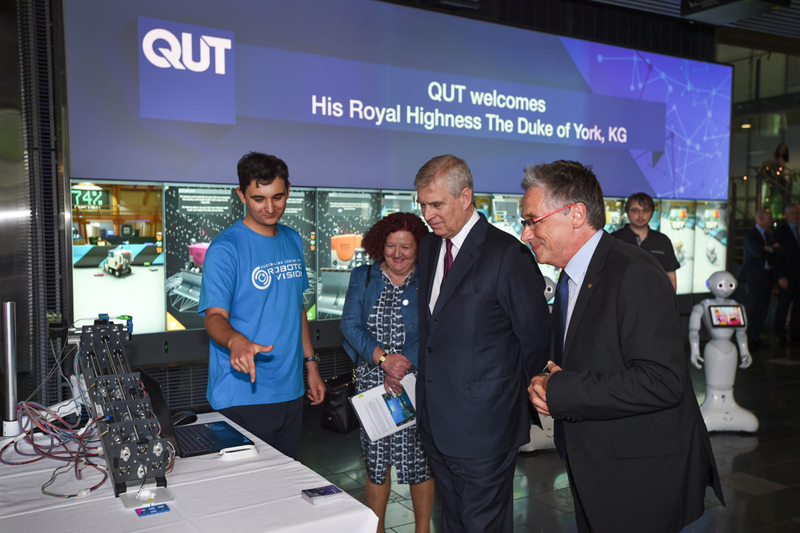 At QUT’s eSports Arena postgraduate students Dylan Poulos and Michael Trotter provided Prince Andrew with an overview of their research into gaming and the structured programs in place to help eSports athletes progress from amateur to professional status. QUT is the first university in Australia to provide scholarships to students accepted to study at QUT that are based on their gaming abilities. At The Foundry Prince Andrew engaged with QUT Young Alumnus of the Year Dr Chris Jeffery. Prince Andrew engaged with QUT student and alumni entrepreneurs at The Foundry and witnessed demonstrations of key products including from QUT Young Alumnus of the Year Dr Chris Jeffery whose medical device company Field Orthopedics is creating devices to improve surgical reliability while QUT student Liam Norris demonstrated the world’s first flexible beanie helmet that hardens when hit with force. 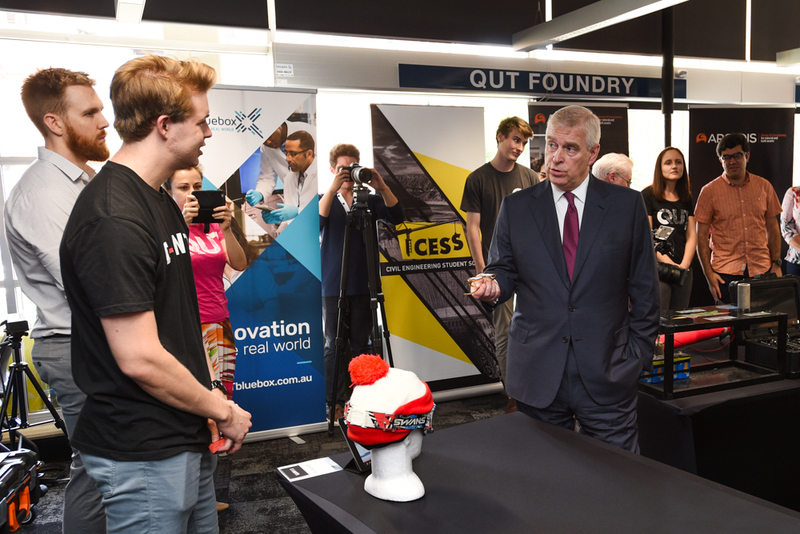 QUT student Liam Norris is one of three inventors of a world first beanie helmet. The use of virtual reality to enable teachers and parents to better understand the difficulties children face when living with a mental illness was also explored with QUT student entrepreneur Leanne Butterworth.